Under its Thailand 4.0 vision, Thailand plans to leverage on its reputation and excellence in medical services and medical devices and strengthen its position as the regional medical hub. To promote medical robotics, Thailand Board of Investment (BOI) has offered a wide range of investment promotion incentives related to three targeted activities – manufacture of automation machinery/equipment with engineering design, assembling of robots or automation equipment/parts, and manufacture of high-risk or high-technology medical devices. For rehabilitation and therapy, robots have played more important roles in assisting patients with lost limb movements and in therapy. SensibleTAB and SensibleSTEP, for example, was developed by a local company to help patients with arm and leg injuries perform practiced movements aided by the robots. SensibleSTEP, a robot for rehabilitative gait training, is the first prize winner of the i-MEDBOT Innovation Contest 2018 held by Thailand Centre of Excellence for Life Sciences (TCELS). In terms of services, medical service robots are also increasing in demand. 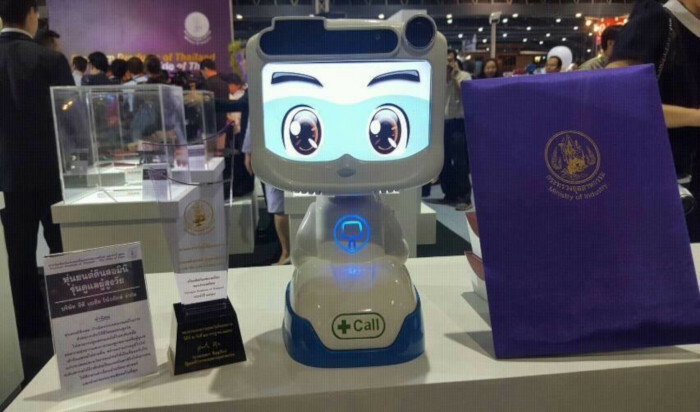 In addition to the well-known Dinsow, an elderly care robot (see featured image above), and BUMBEE, a medical dispenser robot, medical robotics have been used in more areas. ROBODOCTOR, for example, is a remote presence system being used in a number of hospitals, allowing specialist doctors in hub hospitals to assist doctors in remote hospitals in diagnosing and treating patients with complicated conditions, such as stroke. The result is faster and more efficient diagnosis and treatment.